Bibim naeng myun is another popular noodle dish that is enjoyed by spicy food lovers, especially during the hot summers. It's basically a spin off of naeng myun where it's served with a spicy dressing made primarily from gochujang (red chili pepper paste) and eaten all mixed together. A bowl of the soup broth used in mul naengmyeon or plain broth from the boiled noodles itself are often served on the side as a complimentary soup. 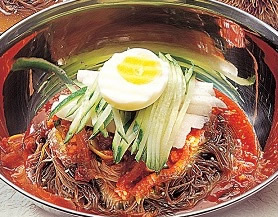 Aside from it's spiciness, its ingredients are very similar to regular naeng myun, which consists of thin noodles typically made from arrowroot or buckwheat flour, garnished with slice of beef or pork, a boiled half egg, Asian pear, and cucumbers. Some restaurants place crushed ice cubes as opposed to chilled nooldes in a metallic bowl.